DC Concierge has five bar stairways to avoid including the #1, the bathroom stairs at Lucky Bar, pictured here. I’d have to say, though, that the #1 stairway I’m glad I won’t have to see again, ever, is the one at the old Murky Coffee/Common Grounds in Arlington, which I always worried would just collapse into splinters one day. I’ll also add that the stairs at Madams Organ always made me just a little uncomfy, but the last time I was there was easily 2005 if not before. My favorite stairs, though, are probably the ones over at 18th Street Lounge, while always add to the “hidden spot” feeling of the whole place. WOW! That photo truly captures the death defying feat of going down the steps at Lucky Bar!!! Haha! Doesn’t it, though, Shana? Feel free to post it, it’s in my Flickr stream. What about the “Exorcist” stairs over in GTown? 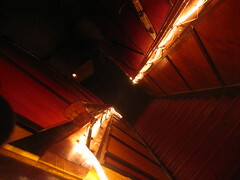 How about the stairs to the roof of Perry’s in Adams Morgan? Treacherous.